specified amplitude, frequency, and midline. What kinds of questions do Ms. Brookins and Mr. James ask their students? How does working with the different scenarios further students' understanding? What can you learn from Ms. Brookins and Mr. James about connecting math to real-world problems? @Rex, Look to the right of these comments and you'll see lesson plans, rubrics, etc. that goes along with the instruction from the video. Let us know if you have any trouble accessing them and come back to tell us how it went. Cheers! Cool, really appreciate the content of the video. I am teaching application of drone in Singapore right now. I would like to incorporate trigonometry in drone flight in my class next month. Would you mind to share the materials about this lesson with me? My email is tanjunbei92@gmail.com. Thank you! Great project. Would it be possible for you to share materials relating to the sine and cosine graphs. I will be teaching trig next year and would like to start the year with an engaging activity. Thank you. Teacher Peggy (in class): Hi. I'm Peggy Burkins. Teacher Raymond (in class): Hi. I'm Raymond James. Teacher Peggy (in class): This is 11th Grade. Teacher Raymond (in class): At Forest High School. Teacher Peggy (in class): And we're dealing with the law of sines, cosines and graphing trig functions. Teacher Raymond (in class): And we're going to fly quad-copters today. Teacher Peggy (in class): We'll get started with kind of a review of the TLA and where we are and what we want to do. So 12 o' Quad High. Teacher Peggy (in interview): This particular TLA is called 12 o' Quad High and we always start it with some catchy phrase so they'll always remember it. Teacher Raymond (in interview): Well, this introduces the idea of a thematic learning activity where you're working as you have a theme, and in that theme you have a group of students working together to solve a problem. Thematic Learning Activity: Over a period of four months, students use math, science and engineering knowledge to research, model, build and fly a four-bladed "quad-copter" drone. Teacher Peggy (in interview): The lesson today centered around application of sine function and cosine function as well as the application of the law of sines and the law of cosines. Teacher Peggy (in interview): The first problem we gave them was on the board I drew the drone itself. And having four propellers on the drone and number them 1, 2, 3, 4. 1 would rotate clock-wise, the other would rotate counter-clockwise so we can achieve lift. Teacher Peggy (in class): So, here's your propeller. Start it where you started. Let's rotate and let's see what happened. Student: So, we're right here. And we're spinning. And that's up at pod 2 and it goes all the way around. And now that we're doing this, I see that our freqency isn't fast enough so we're not gonna get very high off the ground. Common Core Content Standard: Choose trigonomic functions to model periodic phenomena with specified amplitude frequency, and midline. Teacher Peggy (in class): Not yet (laughs). Teacher Peggy (in interview): That period was to get them to see if they would graph correctly. Just one particular rotation with a focus on, "am I going clockwise or am I going counter-clockwise." Teacher Peggy (in class): What do we see different between these two graphs? Student: One's a sine graph and one's a cosine graph. Teacher Peggy (in class): One's a sine graph and one's a cosine graph. Why is that true? Student: Because they have different rotations. Teacher Peggy (in class): This one is going- where are we going? Teacher Peggy (in class): Clockwise. And this one is going? Teacher Peggy (in class): Counter-clockwise. Why does that have to be true? Student: Well, that's how quad-copters work. The opposite pairs of propellers have to be countering each other. Teacher Peggy (in class): But why? Student: So it can turn. Teacher Peggy (in interview): Our first group came up - they were perfect, they graphed just, you know, one rotation of a sine graph. The second group came up, and we just watched them graph the cosine graph but everyone could see that the graph didn't start where it should. Teacher Peggy (in class): What else do we notice about the two graphs? Michael. Student: Shouldn't it be negative sine, not cosine. Common Core Practice Standard: Critique the reasoning of others. Teacher Peggy (in class): Well, we're getting to that. Teacher Peggy (in class): So, he says, "shouldn't it be negative sine and not cosine because he told us he was going in this direction, didn't he? Okay? You're going counter-clockwise so, make your correction. Teacher Peggy (in interview): We do a lot of questioning. And the questioning is to have them really focus on what they're doing. Which is that quantitative literacy thing of saying do I know when to use the mathematics? Do I know the most efficient way to use the mathematics and can I apply the mathematics in its purest form? Teacher Peggy (in class): If you look at all of these graphs, what is the constant thing about all of these graphs? Teacher Peggy (in class): Amplitude! My good man. Amplitude. because why? Content Standard: Graph functions expressed symbolically and show key features of the graph. Student: Because they're all the same. Practice Standard: Reason abstractly and quantitatively. Teacher Peggy (in class): This is the propeller. It's constant. We can't change this. So the amplitude is not gonna change. So, there's really our midline. Right? So we have a peak, here. And that would be the trough if we were looking at it at that point as it rotates. So we don't really have to worry about amplitude. No we're taking off. So, now we want to do something different other than hover. So, I want to go to the left. I want to do this. So, I want to yawl left and change my direction. Teacher Raymond (in interview): We were having them look at the different propellers and their location. And so what we did was say, "ok, so look at two of the opposite propellers and decide what's happening with these propellers as far as frequency is concerned. And so they know one of them had to slow down and one of them had to speed up. Student: For our first graph, for the left propellers, we just kept it like this black one, just, slow. But for our right propeller, we had it going fast, well, high frequency, and then it slowed down again to match the frequency of the left propeller. Teacher Peggy (in class): Why? Student: Because, if it keeps going fast, it's just gonna keep going and we want it to turn and then we want it to level out again so it can go forward and to do that one side can't be going faster - it has to be the same. Teacher Peggy (in class): All right, so we've started off with one rotation. We looked at left and right, up, down parts of the copter. So, now we see what the copter's actually doing and why we're learning stuff that it does make sense. So, what we're gonna do now is fly this thing. Teacher Peggy (in interview): The TLA, the thematic learning activity, was designed to give kids an experience that they'll never forget. And in the experience, we don't want to have them forget the mathematics of the experience as well knowing this is how I'm going to use this. This is why I'm learning this. And this is how to apply anything I learn and then be able to defend that. 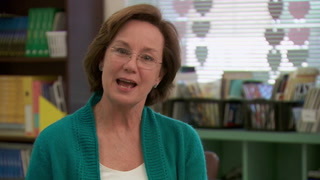 Teacher Peggy (in interview): We gave them the scenario of, there's been a tornado and it has hit Dalton woods. A small community that's about 88 acres so their task was how high do I fly the drone and then where should I position the drone in order to be able to see everything there before I come down to focus in on an area that maybe harder than another portion of the area. The Problem: Calculate the position of the drone so the camera can see the entire 88 acres of Dalton Woods. The camera has a viewing angle of 127 degrees. Teacher Peggy (in class): So, the 88 acres is the total area, so say what you just said about this. Student: It's 18,000' by 18,000'. Teacher Peggy (in class): Which represents how many acres? Teacher Peggy (in class): 88 acres in both directions? Teacher Peggy (in class): Ok, so my question is, how far is it in that direction? Teacher Peggy (in interview): We didn't tell them how high they're going to fly to see if they would use the information that they already had in order to calculate based on this distance can I calculate this distance? In order to determine it. Student: Well, what we did after that is we found a diagonal which was about 26,000' - you see, because we had to know the longest distance with the C.
Content Standard: Apply the Law of Sines and the Law of Cosines to find unknown measurements in triangles. Student: Because, if you can see your longest distance, then you can see everything. Teacher Raymond (in class): So, what things have you considered doing right now? Student: My number's too big. Teacher Raymond (in interview): In our discussions, we realized that their calculations should have been about 6,000' and once they discovered that it was over 6,000' well, that's more realistic rather than 22,000'. Teacher Raymond (in class): When you were working earlier, you said you were working with some crazy numbers. What happened? Student: Well, I got to this point and that's when we're allowed to use a calculator. And used the tangent, and I got like 16,000' and I think, you shouldn't be 3 miles high, that doesn't really make sense. And then I realized that I was radians, not degrees, which is really important when you're working with trigonometry to make sure you're in the right for whatever problem you have. Teacher Raymond (in interview): We had a company, Duke energy, that employed us to look at the transformers on two pole lines. And they were 55 meters apart. And so they're gonna have to do some research and tell us, what's the distance that I need to be away from the pole line so I can see both transformers. The Problem: Calculate the position of the drone so the camera can see two telephone poles 55 meters apart. The camera has a viewing angle of 127 degrees. Teacher Raymond (in interview): And so now they're using the laws of sines. Student: So, now we have our measurements and now we can use the law of sine to solve the problem. Teacher Raymond (in class): Law of sine. What is that? Student: When you have a triangle, and you have a missing angle or side, you can use the law of sines to solve for that angle or side. And in our particular situation, we have these two angles and we can give these angles a variable: A, B. And we can make this C. And then our corresponding sides would be a and b. Well, the law of sines is you can take the sine of angle over this side and set it proportional to the other angles and sides. And then just solve for the missing variable. Teacher Raymond (in class): I see a right triangle, why wouldn't we just use the Pythagorean theorem? Student: Because we're missing both of these sides. Teacher Raymond (in class): Ok, identify the sides for me, please? What's that side - that long side called? I'm looking for a vocabulary word. Student: Ok ,this center line is the bisector. And then this is the hypotenuse. Teacher Raymond (in class): Thank you. Thank you. Good. Teacher Raymond (in interview): One of the scenarios they were involved with was, a coach of a football team wanted to film the game and they wanted the three different scenarios. One scenario was of the whole field, from end zone to end zone. One was just of the field itself which was the hundred yard distance and then of course the red zone. And the red zone area is, of course, the 20 yard area inside the end zone. So, we talked about those 3 scenarios. The problem: Calculate the positions of the drone so the camera can see three different lengths of the football field - 120 yds., 100 yds., and 30 yds. The camera has a viewing angle of 127 degrees. Student: For this one, we used law of sines and we have standard formula and this is height that we are, this is this distance, right here and then these are the two angles. This angle and that angle. So, we solve for B. Now we can use this to solve for all of ours. And then we just plug and chug, basically, and we got 89.7'. Teacher Raymond (in class): Give me a synopsis now. Student: That's how high we need to be from the center of the field to view the entire field. Teacher Raymond (in class): So, that's the 120 yards. That's end zone to end zone. All the way. And what do you have, Ty? Student: I just used the tangent method instead, where because the tangent of an angle is the same as the opposite of the angle, the opposite side divided by the adjacent side, I just took the fact that we knew this side and we knew the angle and I just plugged them into the equation and solved. And then converted. Teacher Raymond (in interview): He didn't use the law of sines, he used the tangent and he said I prefer to do it the tangent way. And of course, they were able to show 3 different way of calculations which was great. Teacher Peggy (in class): Let's kind of summarize what we've done. Tell me one thing you know now. Student: If we have a certain number of angles and at least one side, we can find out all the other angles and sides to get any distance we need. Teacher Peggy (in class): Tell me one thing, Jesse, you know about graphing. Student: We have a parent graph which is our standard function and we can manipulate that function and that will then translate onto our graph. Teacher Peggy (in class): How is that graph useful? Student: The sine graphs that we use to show us our frequency so that would tell us how fast our propeller's need to be going to lift off and to yaw and turn and everything we want to do. Teacher Peggy (in class): Ok, Danielle. Tell us another thing you know. Student: That if you want to see everything, you should base your triangle off the longest distance because you need to see everything so your longest distance is what you should keep in mind. Teacher Peggy (in interview): When we finish parts, we said, tell me something and they were telling us things even though they may have known something about them before now they really own it. Teacher Raymond (in class): Math is real-life application. Math is always real-life application. And we tend to forget that. We tend to get caught up in just number-crunching. And being able to do scenarios like this, where you're actually applying it, now it makes sense. Teacher Peggy (in interview): When you put all of this together, you've got an incredible experience for them to learn mathematics, for them to cad-drafting and for them to learn research and language arts. Teacher Peggy (in class): And this is the product, so, well done. Give yourselves a hand.